Since Sunday was so stormy out, I spent the majority of the day on the couch taking in the SVU marathon! While I was lounging, I also decided it was time to do a little Pinterest re-organization. When I first started my Pinterest account several years ago, I created pretty generic boards, but I’m now finding that it’s really difficult for me to find old pins (read: recipes) because there are so many on one board. Anyone else have the problem? It’s for that reason that I am replacing my Foodie Favorites board with three different boards entitled SWEET, SAVORY and SIPS. While I’ve only made a small dent in moving all the pins onto their appropriate new boards (there were 4,000 when I started! ), you can now find new recipes easier than ever! I also recently created a board dedicated to furry friends – my hope is that pinning adorable puppies and other baby animals will keep me entertained enough so that I don’t actually go out and buy a dog. Click here to check out the new boards and follow my Pinterest! Labor Day weekend I’ll be catching a flight to Utah (my first trip!) to visit my blogger buds, Rachel and Emily! I’m so excited to explore SLC for the first time, hike the beautiful mountains and catch up with my favorite ladies. Since we’ll likely do a long walk + hike each day I’m there, I think I need to finally trade in my sneakers for a new pair of running shoes. You’re supposed to replace them every 3-6 months, but it’s been over a year – it’s time!! A few styles I like include these orange + blue New Balance sneaks, this pair by Brooks (in coral + blue) and this pair by Nike. Since my current pair is by Brooks, I’ll probably just do that again (also love this bright turquoise pair!). I also want to pick up a couple of new workout tops and jackets – this lightweight marble-print jacket is on my list as well as this aquamarine windbreaker. I wouldn’t mind having this matching marble tank or this versatile tank. What are your plans for Labor Day weekend? Have you checked out the new Piperlime? The site re-launched with a whole new look and I love it! Some pretty new arrivals you need to see: the stitching on this BCBG jacket reminds me of my favorite Proenza Schouler blazer in the best way. Wouldn’t it look great with these coated skinnies? If you’re into the chic look of pearl rings right now like I am, you’ll love this one by Rebecca Minkoff. This Cynthia Vincent layered blouse is just the easy piece I need as a weekday go-to this fall. Some other jewelry items I’m eyeing include this sleek rose gold watch and these gorgeous drop earrings! Oh what I would give for #2 and 9, great list. 8, 9, 11, and 14! OMG – obsessed with those. Love the lace top and sweats. I’ve been on Piperlime for the last few days. I have a problem. That dress! I love the print – so fun and flirty! Love the necklace and clutch and the lips are so fun! Great list! Love all these grey and red items. I dont usually wear a lot of red..but that great lace top is changing my mind. Oh my gosh I totally feel you about things getting lost on your pinterst boards. Love your idea to take the time to go through and do some re-ogranzing. Im going to add that to my to-do list! I want it ALL. 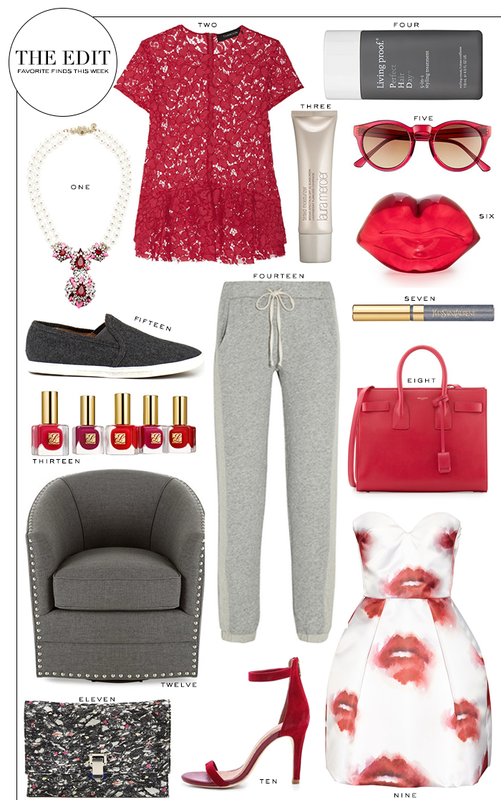 The necklace, the lace top, that amazing lip print piece, the bag…… ah! I basically love all of these picks. gorgeous! Your edits are my absolute favorite!!! Love the red/lips theme of this one!!! I love it all! That red lace top is amazing. And I adore the red shoes! That red lace top is absolutely adorable! those pants look SO comfy and I love all the red! I don’t know what I’d do without my Laura Mercier moisturizer! Have you tried her primer too? So worth it! A trip to SLC sounds like a fun way to spend the long weekend. I’ve never been but it looks incredible! Excellent Edit, as always. #5 and #8 are particularly drool worthy, and furry friends on Pinterest is the way to go. My dog Scout has chewed up the DirecTV cables twice…this week!